SAN DIMAS >> The gap may have closed a bit, but the South Hills High School football team is still king of the Covina Valley Unified School District. Jesse Garcia rushed for 233 yards and two touchdowns to lead the Huskies to a 38-29 victory over intra-district rival Covina Saturday at San Dimas High School. Garrett Fonseca threw for 60 yards and two touchdowns for the Huskies, who beat the Colts for the second consecutive season. Joe Benavidez threw for 178 yards and a score and Pearnell Smalley rushed for 120 and touchdown to lead Covina. 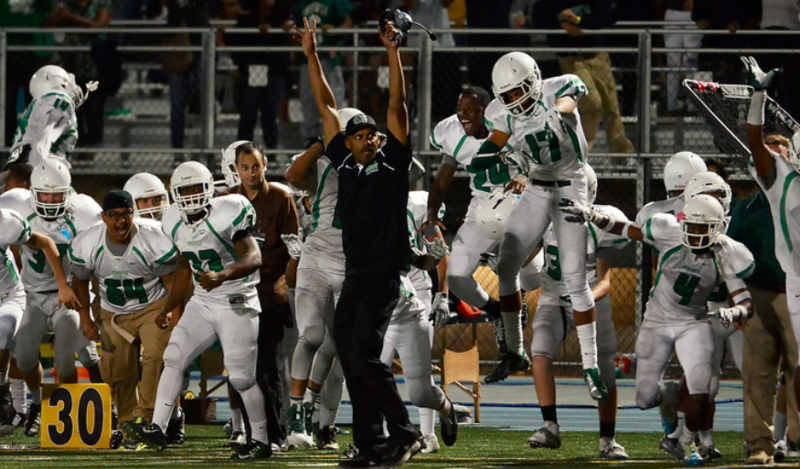 WILDCATS RALLY: Monrovia came all the way back to knock off defending CIF-Southern Section Mid-Valley Division champion San Dimas 24-23 in overtime, rallying from a 17-0 deficit to pull it out in the season opener for both schools on Friday at San Dimas. San Dimas’ Bobby Rios scored on a 1-yard touchdown run to give the Saints a 23-17 lead in overtime, but a blocked extra point gave the Wildcats an opportunity to win it with their possession. Green Valley, NV., 26, Charter Oak 23 — Not bad against one of the best teams in Nevada. Diamond Bar 48, Montebello 14 — Huge win for its new coach. San Marino 56, Arroyo 24 — Guess the Titans are the real deal. Maranatha 42, Bassett 20 — Minutemen win in Steve Bogan’s debut. Pasadena 50, South El Monte 7 – Bulldogs haven’t felt this good in a long time. La Salle 34, Compton 0 — Not surprised by win, but final score. Cerritos Valley Christian 50, Duarte 6 — Thought Falcons were better than this. Los Altos 12, Santa Monica 6 – Conqs hold on, get San Dimas next. Alta Loma 36, Rowland 7 — Move to Valle Vista will eventually help. Don Lugo 41, Walnut 13 — Not surprised, Lugo that good. Colony 26, West Covina 7 — Colony this good, or will Bulldogs struggle again? Jurupa Hills 23, Gladstone 0 –– Could be another long Gladiators season. 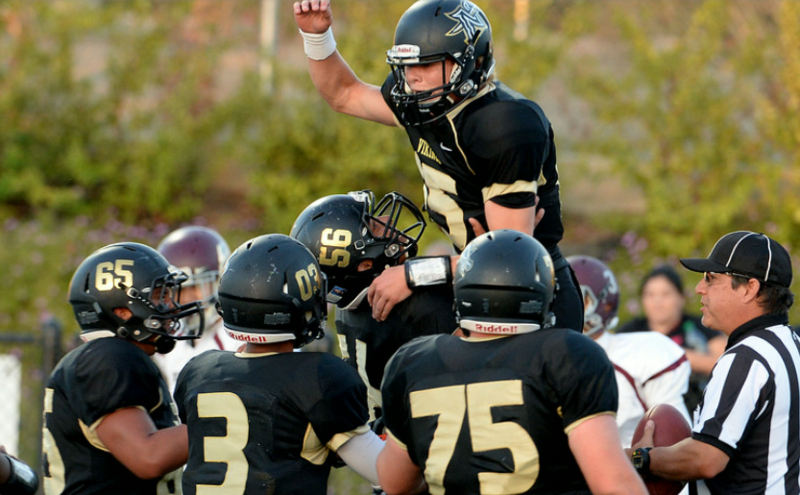 Northview holds on: What an exciting way to start the season. Northview held off a furious rally from Rosemead to escape with a 27-21 victory in the season opener for both schools at San Dimas High School on Thursday. Panthers quarterback Steven Nava, who struggled early, came on late to finish with 193 yards and two touchdowns, but it wasn’t enough to rally the Panthers from a 20-point second-half deficit. Nava, who made headlines over the summer after transferring to Bishop Amat and then transferring back a couple weeks ago, threw a desperation pass on fourth-and-long with just over two-minutes left that fell incomplete, allowing the Panthers to breathe easy again. La Puente Rolls to victory: La Puente has moved to the Miramonte League this season and former Montview League rival Sierra Vista is probably happy to see the Warriors go. Two-Minute Drill: Is Aram and Fred taking Bishop Amat over Santa Margarita homer predictions?